New microscopy cameras with Sony´s Pregius sensors and PYTHON Sensors from ON Semiconductor offer high resolution and speed. The innovative sharpening feature provides optimized images without loss of speed. Ahrensburg, 01 March 2017 – Basler AG from Ahrensburg, the world's leading manufacturer of industrial digital cameras, is supplementing its PowerPacks for Microscopy with additional Microscopy ace camera models including the latest CMOS sensor technology. The PowerPacks offer high-quality cameras together with components for a simple system setup and installation. The Microscopy ace 3.2 MP and Microscopy ace 5.1 MP are equipped with Sony´s high-quality Pregius sensors that provide a speed of up to 55 images per second. This feature set offers both smooth screening of samples and analysis of movements in even the smallest samples. Overall, these Basler cameras deliver image quality that previously could only be achieved with expensive CCD cameras, but now with lower camera temperature and higher frame rates. The Microscopy ace 1.3 MP 160 and Microscopy ace 1.3 MP 200 offer even higher speeds. In combination with their high sensitivity, these cameras with ON Semiconductor´s sensors reach a resolution of 1.3 MP at up to 200 images per second. They are therefore particularly suitable for the analysis of cell movement, in spermatology, or for fast movement patterns, such as in veterinary medicine. All Basler PowerPacks for Microscopy now include a first-of-its-kind sharpening feature to optimize the image for depth of focus. When the magnification is high, the user has to determine one depth level to put in focus. Other image areas remain blurred. The patented algorithm ensures that the user can bring more sharpness into the entire picture. Unlike other manufacturers´ products, this in-camera image optimization feature works without affecting the speed of the camera or the real-time image transmission. In addition to these upgrades, the white balance has been improved to make the white color appear even more pure and radiant. Thus, research objects are better represented during documentation or publication. 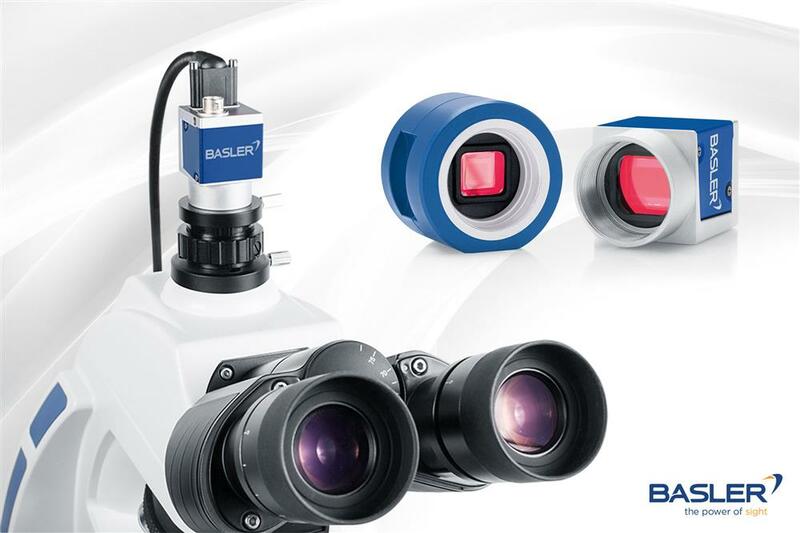 Basler's PowerPacks for Microscopy include cameras with the latest and cost-optimized vision technology. Each microscopy camera comes with a fully tested, high-quality USB 3.0 cable, an easy-to-understand installation guide and professional microscopy software. The PowerPack provides both accurate and reliable image acquisition and analysis, as well as an easy system setup and installation. Basler is a leading global manufacturer of digital cameras for industrial and retail applications, medical devices, and traffic systems. Product designs are driven by industry requirements and offer easy integration, compact size, excellent image quality, and a very strong price/performance ratio. Founded in 1988, Basler has more than 25 years of experience in vision technologies. The company employs 500 people at its headquarters in Ahrensburg, Germany, as well as in international subsidiaries and offices in Europe, Asia, and the Americas.